We've been at our new location for a little over two years now, but that's not still the only new thing around here. In addition to a new brand and new products, we've been growing within our departments as well. Since I like to keep you guys updated on who and what's new around here, what better way to start than with the people who answer your calls and greet you at our door! 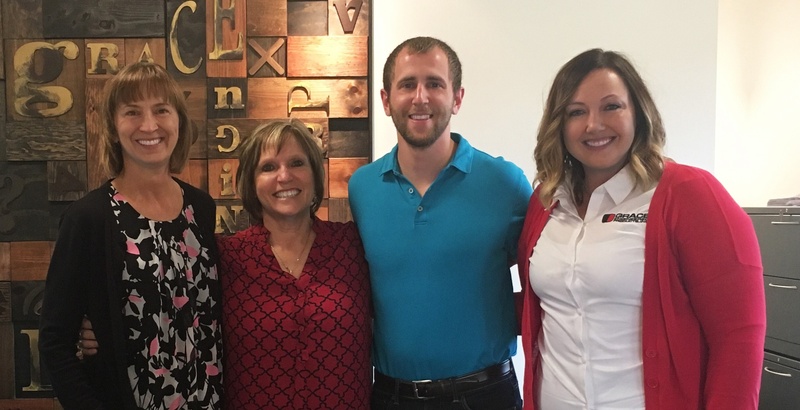 From left to right, we have Wanda, Edna, Bryce, and Nikki who all make up our Inside Sales team. Wanda has been with Grace for ten years and for the better part of that decade she was responsible for building, packaging and shipping your orders from our Production team. With Wanda recently transitioning into Inside Sales, she was able to fill the vacant role of Order Entry Associate and she's also the first person who greets you with a smile as you walk into our building. Wanda loves to dance and has a great partner to do so with; her husband, Kerry, knows how to get down on the dance floor and the two have a blast at Christmas parties; I've seen it! Beyond dancing, she likes playing pickle ball, bicycling, hiking, and Jeeping (it's a Jeep thing, you wouldn't understand). Wanda and Kerry have two daughters, two grandchildren, and one spoiled grand-dog named Chief! Edna's my office mom, but when she's not taking care of me with her homemade cookies and essential oils like that one time I got stung by a wasp; she's providing top notch customer service as our recently promoted Business Development Executive. Edna's been with Grace for over six years and has one of those positive attitudes that's just contagious. Don't tell her I told you; it'll just go straight to her head (huge ego)! But seriously, she's an active participant at her church and loves to get involved in any sort of charity we work with here at Grace. When she's not serving customers or her community, Edna loves long walks and biking with her husband, Jeff, on their Indian Road Master. Together with her husband, she's a real mom to three children in three different time zones! The couple just recently became grandparents as they welcomed their first grandbaby into the world; thankfully within the same time zone! Bryce is the newest addition to our Inside Sales team as our Business Development Engineer. Among learning about the many products and industries we serve, he's also learning about the Grace-15 (the fifteen pounds you can gain when you start working here, thanks to Edna's cookies!). You have to stay active to work here and fortunately that doesn't sound like a problem for Bryce; according to his wife, he's got too many hobbies! Bryce claims he "enjoys" projects around the house (blink twice if you're being held against your will), but some of those projects do sound pretty cool. As a microbrew fan, I was excited to hear he's building a bar in his basement and also brews his own beer, but I guess that's just mandatory when your last name is literally Brewer. Bryce and his wife, Marie, have a puppy named Cece who's packed full of energy. And fun fact: he also has a twin brother and they both attended and received their degrees from Western Illinois University. Now that you've met the Associate, the Executive, and the Engineer, I'd like to introduce you to our Business Development Manager, Nikki―Nikki has a Business Major and Spanish Minor Degree from the University of Iowa with an Entrepreneurship Certificate; the perfect cocktail for developing business at a growing international company. She started six months ago and has been nothing but a fun, charismatic, and innovative leader with great ideas. Nikki enjoys live music, especially if it's country, traveling, and being a social butterfly with friends and family. She and her husband, Ty, welcomed home a beautiful baby girl last October; their daughter, Hanna, who makes having a baby sound easy because of how amazing she is! A couple weeks ago, Nikki, came up to my desk and asked if we could do a cool new thing on the blog. The Inside Sales team has seen the most change recently and she thought it might be fun to do a profile of the department here on HUMPDAY. Turns out I really like the idea and I'm having so much fun slandering and embellishing about my coworkers that I think we should do this for every department in a monthly segment called HUMPDAY Meet & Greet. So I hope you enjoyed getting to know some of the Team Grace members and we'll look forward to doing this again soon! 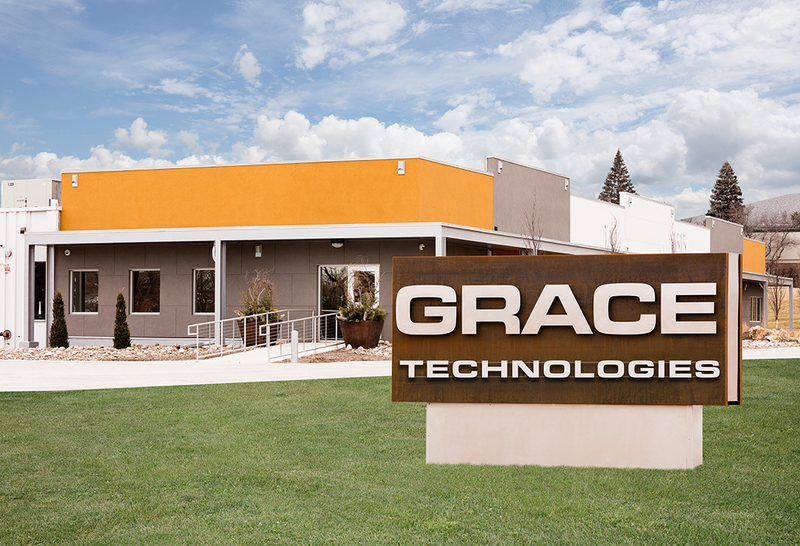 For more on the people who make up Grace Engineered Products, you can check out our Team Bios page. Hit the button below and have a great week!